Our Calgary Orthodontic office is located on the 3rd floor of the Crowfoot Business Centre on the corner of 200 Crowfoot Gate and Crowfoot Crescent North West, where our patients enjoy free parking. This contemporary office has a front desk designed for the comfort and convenience of our patients and their families, where our administrative staff are eager to assist you with all you administrative needs. It’s our goal at Cory Liss Orthodontics to provide our patients and their families with great orthodontic care. Our self check-in station is one of the many ways we ensure that each visit is an enjoyable one. 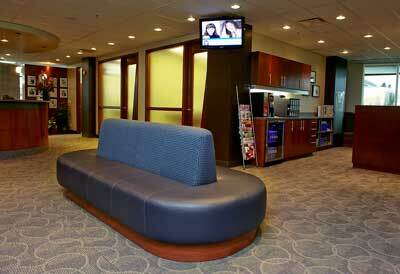 A comfortable reception area for our patients is important at Cory Liss Orthodontics. It allows patients and their family members to relax and unwind. Our refreshment and games area are both a big hit, and we encourage you to take advantage of them. Our orthodontic treatment area is bright and cheerful – thanks to the great view of the Rocky Mountains and our cool blue chairs! 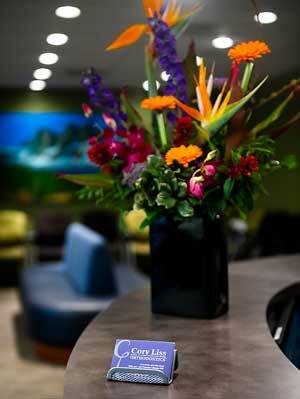 Patients are able to relax, making every appointment a great experience. 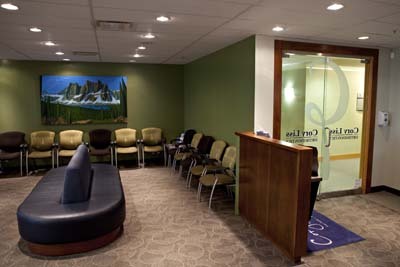 This Calgary Orthodontic office welcomes new patients, and we encourage the referral of your friends and family.